A bluish-white spiral galaxy hangs delicately in the cold vacuum of space. Known as NGC 1376, this snowflake-shaped beauty was observed with the Hubble Space Telescope. Concentrated along the spiral arms of NGC 1376, bright blue knots of glowing gas highlight areas of active star formation. These regions show an excess of light at ultraviolet (UV) wavelengths because they contain brilliant clusters of hot, newborn stars that are emitting UV light. The less intense, red areas near the core and between the arms consist mainly of older stars. The reddish dust lanes delineate cooler, denser regions where interstellar clouds may collapse to form new stars. Visually intermingled between the spiral arms is a sprinkling of reddish background galaxies. 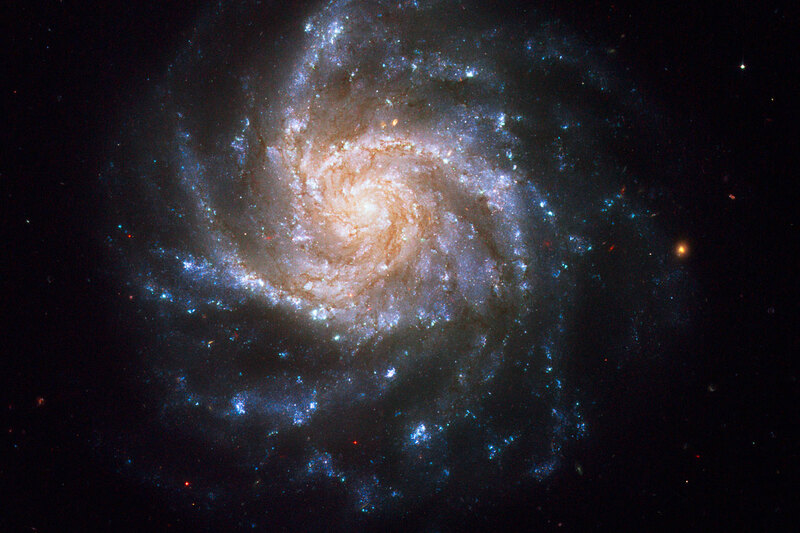 NGC 1376 resides over 180 million light-years away from Earth in the constellation Eridanus. 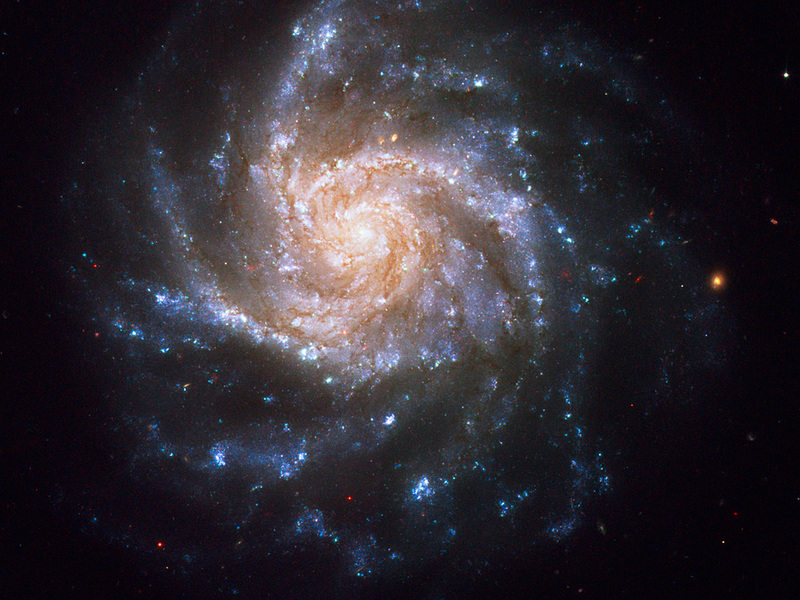 This galaxy belongs to a class of spirals that are seen nearly face on from our line of sight. Its orientation aids astronomers in studying details and features of the galaxy from a relatively unobscured vantage point. One such feature is represented by stars that vary in brightness over time. In 1990, NGC 1376 was home to a supernova explosion (SN 1990go) that rivaled the brightness of the entire nucleus (as seen from ground-based telescopes) for several weeks. The story of how this galaxy came to be photographed by Hubble is somewhat unique. During the November 2006 observations of a nearby dwarf galaxy with Hubble's Near Infrared Camera and Multi-Object Spectrometer (NICMOS) detector, careful planning allowed for NGC 1376 to be visible in the field of view of the Advanced Camera for Surveys (ACS) at the same time. Thus, Hubble was able to get two galaxies for the price of one. Although the use of parallel instruments onboard Hubble is not uncommon, capturing two interesting targets is rather rare. Initial ground-based observations of NGC 1376 and its nearby dwarf companion implied that the two might be interacting with each other, but the Hubble observations demonstrates no obvious signs of interaction. 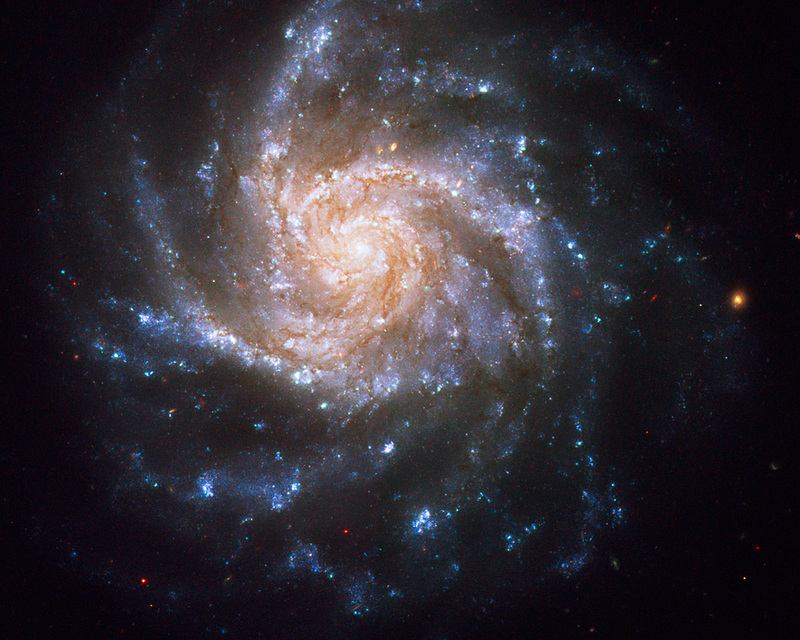 This is not surprising since the dwarf galaxy would have little effect on this giant spiral galaxy. NGC 1376 was imaged with ACS in eight filters ranging from blue to visible to infrared light. Four of the filtered images that show the most colour separation were used in this Hubble composite of NGC 1376. Position (Dec): -5° 2' 44.36"